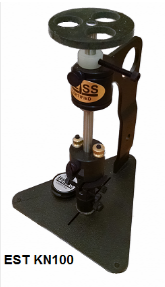 KN100...This was our first instrument offered to the professional sharpener and avid knife enthusiast and even those first units are in service today and will be for a very long time to come. We've made a lot of progress with and improvements to our instrumentation but as far as durability and accuracy are concerned, no new instrument exceeds the performance of our original KN100. These units are "legacy instruments" meaning that they will still be in service, perhaps even used by your grandson or grand daughter, 20 - 30 - or 100 years from now because they are built to last with no electronic parts. The KN100 is a mass device. That means that weight is added to the upper platen until the test media severs. The added mass is weighed on a digital scale (not provided) in grams and that number is then your BESS score on the BESS A scale. Our operational videos and manuals for this unit are in the library section of this web site. We invite you to take a look if you would like to learn more about the KN100. Our first offering to the industrial and medical market. The ME110 operates on the same principle as our KN100 and the accuracy and durability of these units is identical. We always referred to the ME110 as the bigger, more flexible brother of the KN100 because the ME110 is configurable for the many different shapes and sizes of edges found in industry. 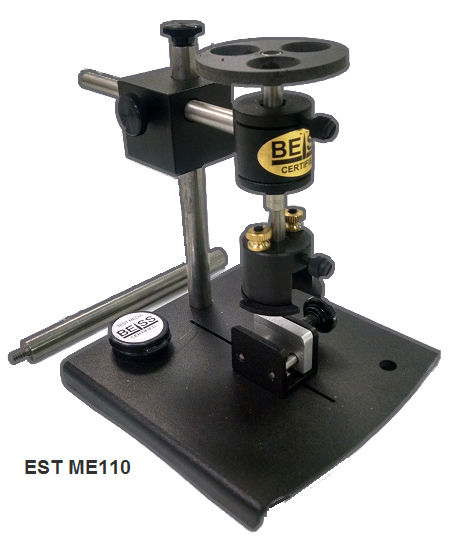 The ME110 also includes an extension that will allow edges up to 7 inches tall to be fixtured and measured. If you would like to learn more about the ME110 please visit our library page where you will find both video tutorials and operating manuals.